Hello everyone! It’s funny, but a year ago I was told that I’d write a book about Reiki and I laughed and said that was silly, that there wasn’t anything to say about Reiki that wasn’t already in a book. I stand corrected. Recently, I was at The Cleveland Clinic, where I volunteer with the Healing Services Department giving Reiki to patients, family and staff. I was talking with the head of the department, telling her that I’d love to teach Kundalini Reiki to staff there. She told me that people feel that the word “Kundalini” is too mysterious and has negative or strange connotations. So I said I could change the name and take out the word “Kundalini” and the method would still work and have the same effectiveness. I checked it out with Ole Gabrielsen, the founder of Kundalini Reiki, because I wanted to be sure it was okay with him that I’d make adaptations to the method he channeled. He told me that it would be just fine. Green light! So instead of revising the Kundalini Reiki manual, I decided to put everything I say when I’m teaching into a book. There’s a lot that I have been adding when teaching in person – information on clairs, chakras, intention -all important stuff! My family went on vacation to Virgina Beach – a 10 hour drive each way – and so I took my laptop in the car and typed the first five chapters on the drive. It was a good start! Now the book has 10 chapters, includes FAQs, recommended books, and two Appendixes (a quick guide for teachers at the end, and articles on using a pendulum and Master Kuthumi). The cover is absolutely gorgeous, thanks to a talented graphic designer who was able to beautifully recreate my attempt to express a design! for balance, well-being, and vibrant health. A guide to a simple, revolutionary energy healing method. If you’ve never heard of Reiki, this book will explain it in plain, clear language. Reading the book will help you understand what Reiki is, how it works, how it helps, and how it can be learned. This book presents a down-to-earth, “woo-woo-free” approach that’s easy to understand whether you’ve had any experience with intuition or none at all. Anyone who wants to learn to connect with the innate, natural power for healing is capable of doing so. If you already practice Reiki, this book will show you the true essence of working with energy, beneath the ritual, symbols, and mystery surrounding the practice. It will widen your knowledge and strengthen your connection. Practical Reiki TM is a new, revolutionary Reiki modality for everyone who wishes to quickly and easily learn to practice Reiki energy healing for themselves and others. It is simple, strong, and will change your life. The entire method through Master level can be learned in just three weeks. 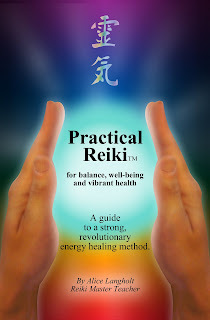 For an autographed copy of Practical Reiki, use this link to order directly from me! Just let me know how to inscribe it! Who knew, when I started this blog as a Reiki level 2 practitioner, that I’d be writing this post today?! Not me for sure!! Thank you all for being here for this journey with me, and for the path ahead! Does Reiki involve working with angels?